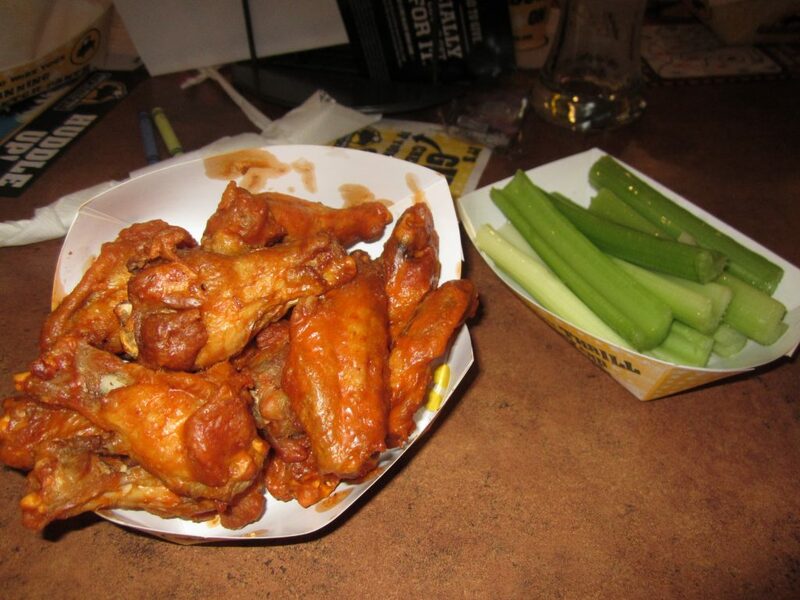 For those of you who have never heard of Buffalo Wild Wings, it is a chain restaurant specializing in the almighty wing. My first encounter with this place was in South Carolina years ago. I was amazed at how the menu was laid out. Normal restaurants have wings as an appetizer or a “side-note,” and the thing that amazed me about this place is that it had the wing as the star. They have many different ways of ordering the wing: on the bone, boneless, naked, etc. But what they are mostly known for is their variety of sauces. With a wide array of flavors ranging from mild to blazing hot, they have tons of flavors and seasoning for you to choose. Out of the plethora of choices such as Teriyaki, Spicy Garlic, Thai Curry, or Carribbean Jerk, I decided to go with the twelve piece bone-in chicken wings covered in the classic Medium sauce. I also ordered the Hot and Blazin’ (their hottest blend) on the side for some evaluation. One perk to going here is they WANT you to enjoy their sauces, as bottled versions are available to purchase. So they will let you sample as many flavors as you like, thus, eliminating the dreaded roulette of whether or not you will enjoy your choice when it arrives. And arrive mine has! Time to eat, and boy am I ready. The wings came out tossed in the Medium sauce and placed in a cardboard holder with an extra for the discards. I was offered a choice of celery or carrots (or both) for my side, and so I went with the celery. Nothing fancy there, but they did give a lot more than I was used to getting. After eating the first couple bites, I realized a very important thing: the wings themselves were very standard, nothing special. Typical size, kind of tender, and not that hot. It was the sauces that made these things great, and that alone is what was carrying this meal. The Medium sauce had a nice bit of heat with a sweet aftertaste. It was as described on the menu… “comfortably hot.” I then went on to the Hot sauce. I figured it would taste exactly like the Medium but with more heat. However, I was taken back when it had its own unique flavor. It had a nice tangy flavor with a kick of black pepper and finished with a nice amount of heat that lingered on your lips post bite. But the lingering was nothing in comparison to the Blazin’ hot sauce. The heat from that sauce just punches you in the back of the throat and stays there for a good three minutes. I seriously don’t understand why some people crave this kind of heat. Ultimately I was very happy with the wings, but it was mainly due to the sauce. So much so that Buffalo Wild Wings’ sauce is what I use at home when I fry up my own wings for parties. Now, if they only spent as much time on preparing the wings as they do on perfecting the sauce, this place would be unstoppable.